Iaido (居合道 Iaidō), abbreviated with iai (居合), is a modern Japanese martial art/sport. Iaido is associated with the smooth, controlled movements of drawing the sword from its scabbard or saya, striking or cutting an opponent, removing blood from the blade, and then replacing the sword in the scabbard. While beginning practitioners of iaido may start learning with a wooden sword (bokken) depending on the teaching style of a particular instructor, most of the practitioners use the blunt edged sword, called iaitō. Few, more experienced, iaido practitioners use a sharp edged sword (shinken). The term 'iaido' appear in 1932 and consists of the kanji characters 居 (i), 合 (ai), and 道 (dō). The origin of the first two characters, iai(居合), is believed to come from saying Tsune ni ite, kyū ni awasu (常に居て、急に合わす), that can be roughly translated as “being constantly (prepared), match/meet (the opposition) immediately”. Thus the primary emphasis in 'iai' is on the psychological state of being present (居). The secondary emphasis is on drawing the sword and responding to the sudden attack as quickly as possible (合). The last character, 道, is generally translated into English as the way. 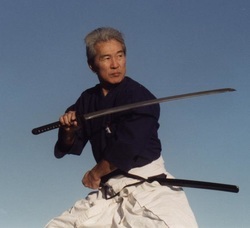 The term 'iaido' approximately translates into English as "the way of mental presence and immediate reaction", and was popularized by Nakayama Hakudo. The term emerged from the general trend to replace the suffix -jutsu (術) ("the art of") with -dō (道) in Japanese martial arts in order to emphasize the philosophical or spiritual aspects of the practice. Iaido encompasses hundreds of styles of swordsmanship, all of which subscribe to non-combative aims and purposes. Iaido is an intrinsic form of Japanese modern budo. Iaido is a reflection of the morals of the classical warrior and to build a spiritually harmonious person possessed of high intellect, sensitivity, and resolute will. Iaido is for the most part performed solo as an issue of kata, executing changed strategies against single or various fanciful rivals. Every kata starts and finishes with the sword sheathed. Notwithstanding sword method, it obliges creative ability and fixation to keep up the inclination of a genuine battle and to keep the kata new. Iaidoka are regularly prescribed to practice kendo to safeguard that battling feel; it is normal for high positioning kendoka to hold high rank in iaido and the other way around. To appropriately perform the kata, iaidoka likewise learn carriage and development, hold and swing. At times iaidoka will practice accomplice kata like kendo or kenjutsu kata. Dissimilar to kendo, iaido is never honed in a free-competing way. The metaphysical aspects in iaido have been influenced by several philosophical and religious directions. Iaido is a blend of the ethics of Confucianism, methods of Zen, the philosophical Taoism and aspects from Bushido. Because iaido is practiced with a weapon, it is almost entirely practiced using solitary forms, or kata performed against one or more imaginary opponents. Multiple person kata exist within some schools of iaido; consequently, iaidoka usually use bokken for such kata practice. Iaido does include competition in form of kata but does not use sparring of any kind. Because of this non-fighting aspect, and iaido's emphasis on precise, controlled, fluid motion, it is sometimes referred to as "moving Zen. Most of the styles and schools do not practice tameshigiri, cutting techniques. A part of iaido is nukitsuke. This is a quick draw of the sword, accomplished by simultaneously drawing the sword from the saya and also moving the saya back in saya-biki. Iaido started in the mid-1500s. Hayashizaki Jinsuke Shigenobu (1542 - 1621) is generally acknowledged as the organizer of Iaido. There were a lot of people Koryu ( customary schools), however just a little extent remain today. Just about every one of them additionally concentrate on more seasoned school created amid 16-seventeenth century, in the same way as Muso-Shinden-ryu, Hoki-ryu, Muso-Jikiden-Eishin-ryu, Shinto-Munen-ryu, Tamiya-ryu, Yagyu-Shinkage-ryu, Mugai-ryu, Sekiguchi-ryu, et cetera. After the collapse of the Japanese feudal system in 1868 the founders of the modern disciplines borrowed from the theory and the practice of classical disciplines as they had studied or practiced. The founding in 1895 of the Dai Nippon Butoku Kai (DNBK) 大日本武徳会 (lit. "Greater Japan Martial Virtue Society") in Kyoto, Japan. was also an important contribution to the development of modern Japanese swordsmanship. In 1932 DNBK officially approved and recognized the Japanese discipline, iaido; this year was the first time the term iaido appeared in Japan. After this initiative the modern forms of swordsmanship is organised in several iaido organisations. During the post-war occupation of Japan, the Dai Nippon Butoku Kai and its affiliates were disbanded by the Allies of World War II in the period 1945–1950. However, in 1950, the Dai Nippon Butoku Kai was reestablished and the practice of the Japanese martial disciplines began again. In 1952, the All Japan Kendo Federation (ZNKR) was founded, and the All Japan Iaido Federation (ZNIR) was founded in 1948. Upon formation of various organizations overseeing martial arts, a problem of commonality appeared. Since members of the organization were drawn from various backgrounds, and had experience practicing different schools of iaido, there arose a need for a common set of kata, that would be known by all members of organization, and that could be used for fair grading of practitioner's skill. Two of the largest Japanese organizations, All Japan Kendo Federation (ZNKR) and All Japan Iaido Federation (ZNIR), each created their own representative set of kata for this purpose. Despite the fact that the purposes of assault in current Kendo are entirely restricted, the strikes and assaults are performed with an opportunity of will that definitely prompts a component of rivalry. In correlation with shinai Kendo, Iaido focus on preparing to create right developments. Therefore, regarding specialized immaculateness it involves a level much higher than that of shinai Kendo. In short, Iaido can serve to enhance and keep up specialized virtue in shinai Kendo. Iaido aides guarantee that body developments are legitimate and compelling in light of the fact that they are regular, precise, and spry. The All Japan Iaido Federation (ZNIR, Zen Nihon Iaido Renmei, founded 1948) has a set of five koryu iaido forms, called Tōhō, contributed from the five major schools that comprise the organization. Seitei or Zen Nippon Kendo Renmei Iaido (制定) ("basis of the Iaido") are technical based on seitei-gata, or standard form of sword-drawing techniques, created by the Zen Nihon Kendo Remmei (All Japan Kendo Federation) and the Zen Nihon Iaido Remmei (All Japan Iaido Federation). This standard set of iaido kata was created in 1968 by a committee formed by the All Japan Kendo Federation (AJKF, Zen Nippon Kendo Renmei or ZNKR). The twelve Seitei iaido forms (seitei-gata) are standardised for the tuition, promotion and propagation of iaido at the iaido clubs, that are members of the regional Kendo federations. All dojos, that are members of the regional Kendo federations teach this set. Since member federations of International Kendo Federation (FIK) uses seitei gata as a standard for their iaido exams and shiai, seitei iaido has become the most widely practised form of iaido in Japan and the rest of the world. Single-style federations usually do not have a standardized "grading" set of kata, and use kata from their koryu curriculum for grading and demonstrations. Many iaido organisations promote sword technique from the seiza (sitting position) and refer to their art as iaido. One of the popular versions of these is the Musō Shinden-ryū 夢想神伝流, a iaido system created by Nakayama Hakudō (1872–1958) in the 1932. The Musō Shinden-ryū is an interpretation of one of the Jinsuke-Eishin lines, called Shimomura-ha. The other line of Jinsuke-Eishin, called Tanimura-ha, was created by Gotō Magobei Masasuke] (died 1898) and Ōe Masamichi Shikei (1852–1927). It was Ōe Masamichi Shikei who began formally referring his iaido branch as the Musō Jikiden Eishin-ryū 無双直伝英信流 during the Taishō era (1912–1926). Ranking in iaido depends on the school and/or the member federations to which a particular school belongs. Iaido as it is practiced by the International Kendo Federation (FIK) and All Japan Iaido Federation (ZNIR) uses the kyu-dan system, created in 1883. Modern kendo is almost entirely governed by the FIK, including the ranking system. Iaido is commonly associated with either the FIK or the ZNIR, although there are many extant koryū which may potentially use the menkyo system of grading, or a different system entirely. Iaido as governed by the FIK establishes 10th dan as the maximum attainable rank, though there are no living 10th practitioners. While there are some living 9th dan practitioners of kendo and iaido, the All Japan Kendo Federation only currently awards up to 8th dan. Most other member federations of the FIK have followed suit. Iaido, in its modern form, is practiced as a competitive sport, regulated by the All Japan Kendo Federation. The AJKF maintains the standardized iaido kata and etiquette, and organizes competitions. An iaido competition consists of two iaidoka performing their kata next to each other and simultaneously. The competitors will be judged by a panel of judges according to the standardized regulations.